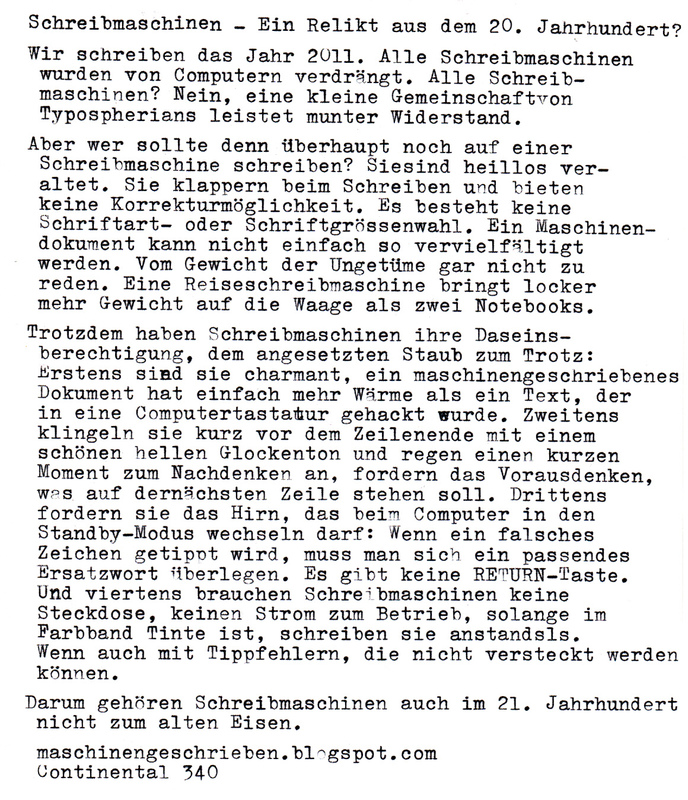 maschinengeschrieben: text: (with translation) Schreibmaschinen - Ein Relikt aus dem 20. Jahrhundert? 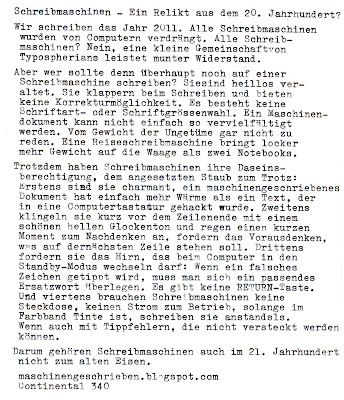 text: (with translation) Schreibmaschinen - Ein Relikt aus dem 20. Jahrhundert? This is the first longer text I wrote on and about typewriters, in last April. I've re-written it in August. Now, to celebrate our 200st post today, we publish it. You may find a corrected English translation after the break. Typewriters - A relict from the 20th Century? strong as ever, against the invaders..
Typewriter? They are hopelessly antiquated. written document can't be reproduced easily. Not to talk about the weight of the monsters. more weight on the scale than two laptops. that was pecked into a computer keyboard. what should be on the next line. replacement word. There is no RETURN key. as long there's ink in the ribbon they write without difficlty. Albeit with typos, which can not be hidden. not in the scrap heap. But we are in AD, not BC. Couldn't agree more with this. What's more, in what could be seen as an act of insanity, I'm shelving my laser printer in order to free its space on my desktop for my typewriter. Very nice typing and sentiments! It took me years to part with the portable Royal that saw me through high school and college, partly because I knew it would always work, no matter what. My husband finally convinced me to let it go. That was years ago; it's funny that he collects typewriters now. @Richard: That's right, thanks for the correction. @MEK: Thank you. Funny story, indeed. Very good. Imagine a PC or printer lasting a century and being useable. @Fernando: That is totally correct. In German, we know the expression "Wegwerfgesellschaft", "throw-away-society".